Have you ever watched a sled dog team? The dogs are assembled in two groups, running side by side. They’re positioned based on their abilities to perform. When the musher has every dog running in unison, straight ahead at the same pace, the sled gets to its destination smoother and faster. It’s the same situation with multi-store, multi-channel eCommerce business. If each store and channel run without proper performance analysis and reports to guide business decisions, you could be losing opportunities to make more money. Like a three-legged stool, your eCommerce business needs products, customers and the performance tools to manage them all. 80% of online retailers are not utilizing analytics correctly, are you one of them? Don’t make this mistake because multi-channel, eCommerce analytics tools provide valuable KPIs. Some of those include historical sales data, trends, inventory and other critical information. Products – Discovering the most profitable products, the best bundles and the least sales. Customers –Treating different people differently is the tried and true way of boosting conversation rates and profits. This is called customer segmentation! A successful marketing approach for each of these groups relies on data for proper segmentation. Analysis and Reporting Tools – Knowing the performance of each channel and store allows you to allocate resources, accordingly, saving time and cost. We have gathered the best features and benefits of Glew.io and why you should consider them as part of your web development agency or marketing strategy agency delivery for your enterprise eCommerce business. This SaaS business intelligence company contains approximately 85% of the most desired functionality out-of-the-box for eCommerce, and they can customize any additional features you may require. By applying their Extract-Transform- Loaded (ETL) data and QuickStart calculations library, their Intelligent Data Warehouse can accelerate the creation of custom queries 20 times faster than if you use a BI Tool on your own. Michael Vadini founded Glew in the summer of 2014. A serial entrepreneur by trade, Michael gained experience from his past three successful ventures. He learned that most companies do not have the business intelligence needed to run as profitably as possible. With headquarters in Charlotte, North Carolina, Glew has revolutionized the business intelligence space. They simplified an incredibly expensive, lengthy and risky project-based workflow into a simple, reliable business intelligence subscription. Provides all your data sources transformed (ETL). It offers an intelligent data warehouse (Glew Enterprise) for customer reporting/visualizations using your BI tools. Integrations Pipeline –This is the process where they will import your data from all sources into one place and integrate with your current systems. If required, they will customize any integration for you within 60 to 90 days. ETL (Extract-Transform-Loaded) - Transform your current data from various sources into a structure that allows it to be queried. Data Warehousing – Glew will maintain the integrity of the database even if the connections with your vendors or platforms change over time. BI Tool Included – Glew bundles a BI Tool into the subscription to simply your reporting needs even further. You can start generating custom reports right away. Calculations – There are over 200 calculations that run Glew.io. It translates complex calculations like LTV and attribution model into visualizations that are easy to understand and manipulate. Delivery – This is the delivery of the actual visualization and where you interact with the system. The Glew team does their work from steps 1 to 5 in the backend. Glew has increased our profit by over $20k a month! We used their Zero Purchase customer segment, sent a 20% off coupon to over 1,200 people who had created an account but never purchased. The results were amazing! We generated over $35,000 in revenue that resulted in $20,000 of profit. Glew’s high-quality reports provide insight into your customer segments, profitable products, sales channels and advertising campaigns. Analytics include over 200 pre-built metrics for customized reporting on anything you want to see in your store. In short, you can create any reports within the three primary areas which are customer data, product analysis and performance management. Their easy to use eCommerce CRM delivers personalized marketing campaigns for better retention and customer loyalty. Furthermore, you will gain valuable insights into your customer lifetime value, future value and purchase behavior. Individual Customer Details – It provides customer’s order history, the channel of attribution and abandoned cart information. Additional information such as how long they have been your customer, Average Order Value, Frequency of Orders Per Year, Geographic Location, and Total Spent will help you enhance your customer service and marketing approach. Lapse Point - A Glew proprietary metric that helps identify your active, at risk and lost customers. With this information eCommerce marketers can adjust their campaigns accordingly such as sending customized messages, offering discounts and loyalty programs based on their status. Over 20 unique Customer Segments – Export and upload or utilize their auto-push feature to bring these segments into your preferred email management platform. You can also breakdown purchasing behavior into unlimited segments for higher returns and better marketing decisions. Customer Details Page – Information such as customers’ order history, the channel of attribution and abandoned cart are some of the crucial information available. It allows your customer team to provide professional and outstanding service. You can combine customer data with Google analytics to create an accurate attribution model. It’s scalable for enterprise level to maximize your marketing strategy. Product analytic software is vital to your eCommerce business. Glew consolidates your data from disparate silos and creates sensible, actionable reports from it. They make it simpler to discover revenue generating opportunities with over 20 “out-of-the-box” categories of information while allowing you to create infinite custom segments on your own. 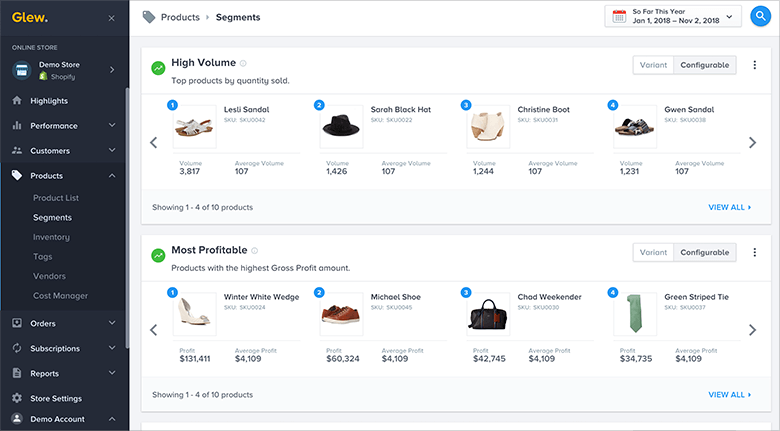 Product Segments – This is the high-level overview of your store’s performance and consists of 17 reports like High Gross Margin, High Volume, Most Profitable and Hot Products to name a few. Product & Category Level Insights – These reports provide more detail such as Revenue, Cost of Goods Sold, Gross Profit, Refunded and five others. Individual Product Level Insights – For more granular information at an individual product level, Glew offers 13 customized reports to optimize your store’s sales and marketing strategy. With one-click reporting, view Best Bundles by Volume, Gross Profit, Inventory Velocity, Average Price, Cost Per Unit and more. Cost of Goods Sold (COGS) - Batch import COGS data to gain accurate insight of store performances across all channels. It enhances product strategy and maximizes growth. Get a visual analysis of how each product affects the cash available and costs associated with marketing. From high-level insights to individual product strategy, Glew provides all the information you need to market the right products in the proper channels. 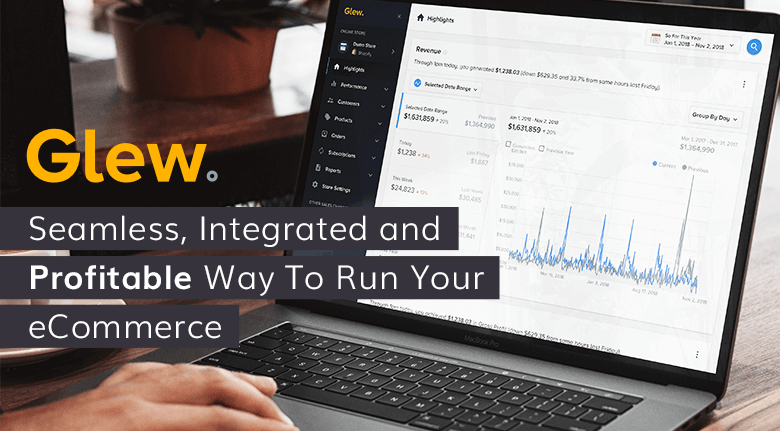 Glew Store Performance Management Tools automatically combine eCommerce store data with the data from digital advertising channels, Google Analytics, and email campaigns. Their powerful cross-channel analytics saves your team many hours each week when generating reports. 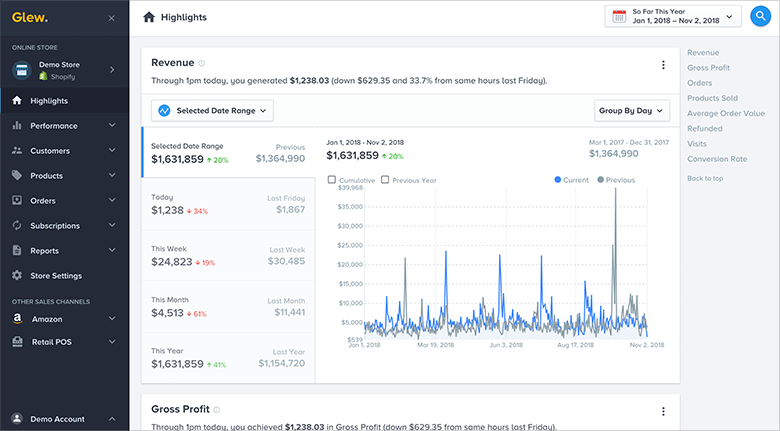 Overview Metrics Dashboard – Glew provides eCommerce store owners with real-time data of each store’s performance year to date. Filter key metrics by the day, week, month or year and create instant historical comparisons based on any date range. Customizable KPIs – Customize KPIs that matter most to your operation. One advantage of Glew is that every chart has sentence-based explanations rather than raw data, making reports easier to interpret. Additionally, you can filter any metric to display information based on Sources, Days of the Week, Devices, Channels, Metros or Campaigns. Store Performance Insights – View every report and metric from the Performance Dashboard. Quickly generate reports such as Gross Revenue, Sales Margin, Cost of Goods Sold by Channel, Advertising Spend, Shipping Revenue and ten other performance reports. Revenue By Channel – Report and track results of revenues, traffic, sales from each marketing channel. You can easily view them in a net profit by channel chart. The data capabilities of Glew’s system can uncover hidden profit potential for any eCommerce retailer. Here are two success stories from Glew’s customers. Forecasting is a difficult problem for most companies. The consumer electronics business can be especially tricky due to the long lead times for the semiconductor materials, which can be 200 days or more. Glew shared a case study, BlinkForHome, a medium-sized company with multiple channels on Amazon, Shopify and elsewhere. They had low visibility into their business coupled with outdated data controls. Compounding the issue, their primary BI tool for processing data were Excel spreadsheets. Glew focused on their data visualization and predictive analytics using Glew Plus. Their solution combined the Intelligent Data Warehouse with QuickStart Calculations and their Enterprise App. According to BlinkForHome, the real-time insight into their business turned it around within 30 days for 1/20th of their previous cost of analytics. They were able to meet demand, optimize capital and maximize profitability. A second case study involves an online vendor whose business model is direct to consumer premium alcohol and barware supplied by various major alcohol manufacturers. Their primary challenges were a lack of actionable data across 97 brand categories and 688 products. The solution was Glew Enterprise integrations, intelligent warehouse, and industry data products which provided the sales metrics and analysis for every product and brand. Within 12 months of inception, the client experienced an 80% increase in revenue and a 45% increase in conversions. Because Glew Enterprise allows for unlimited users, each of their partner brands can log into their account to track their brand’s performance. The company’s internal team can access comparison data for individual products and brands. Glew.io saves enterprise and eCommerce owners significant time in generating reporting and information that matters. Most multi-channel, multi-store eCommerce have incredible amounts of data to manage, usually in different silos. Pulling it all together into meaningful, timely information is where Glew excels. What’s good about working with Glew is that they do all the heavy lifting of importing and integrating all your data with all your BI and marketing tools. Integration on the store side is usually one click. Glew handles the rest and integration for any enterprise takes only a day or two. From one easy to use dashboard, eCommerce retailers can optimize and personalize their marketing. In other words, you drive the sled, let Glew manage the sled dogs. To see what Glew Enterprise can streamline your operation, talk to our eCommerce Web Developer teams.